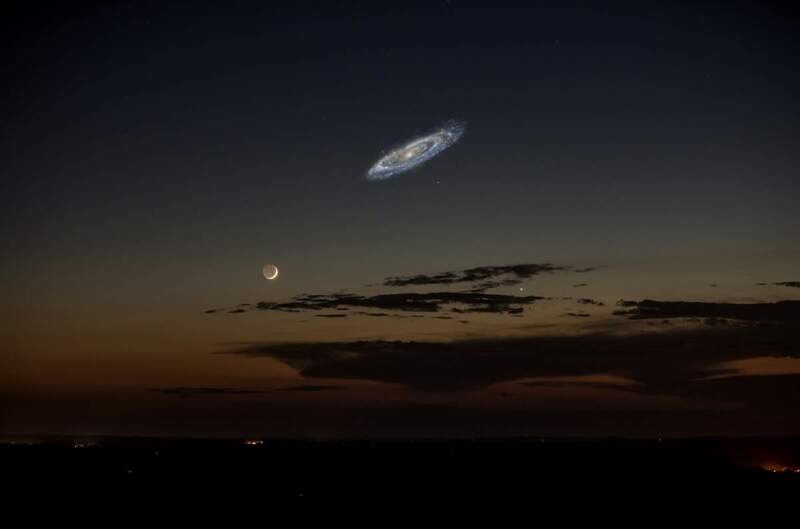 If Andromeda Galaxy were brighter, its appearance in the sky would be amazing. Andromeda is larger than our galaxy, the Milky Way. In fact, it is is the largest galaxy of the Local Group, the galaxy group that includes the Milky Way. It is approximately 220,000 light years across (Milky Way was considered to be about 100,000–120,000 light-years, but according to the recent findings, it may be 150,000–180,000 light-years). 2006 observations by the Spitzer Space Telescope revealed that Andromeda contains one trillion (1012) stars – at least twice the number of stars in the Milky Way, which is estimated to be 200–400 billion. The mass of the Andromeda Galaxy is estimated to be 1.5×1012 solar masses, while the Milky Way is estimated to be 8.5×1011 solar masses. Andromeda received its name from the area of the sky in which it appears, the constellation of Andromeda, which was named after the mythological princess Andromeda. How Earth’s sky would look in a few billion years. Andromeda and Milky way is about to collide. A likely outcome of the collision is that the galaxies will merge to form a giant elliptical galaxy or perhaps even a large disc galaxy. Such events are frequent among the galaxies in galaxy groups. The fate of the Earth and the Solar System in the event of a collision is currently unknown. Before the galaxies merge, there is a small chance that the Solar System could be ejected from the Milky Way or join the Andromeda Galaxy. Here is a video published by NASA depicting the collision between our home galaxy, the Milky Way and the Andromeda galaxy. Hubble Space Telescope observations indicate that the two galaxies, pulled together by their mutual gravity, will crash together about 4 billion years from now. Around 6 billion years from now, the two galaxies will merge to form a single galaxy. The video also shows the Triangulum galaxy, which will join in the collision and perhaps later merge with the Andromeda/Milky Way pair. Milky Way’s Head On Collision. This animation depicts the collision between our Milky Way galaxy and the Andromeda galaxy. Hubble Space Telescope observations indicate that the two galaxies, pulled together by their mutual gravity, will crash together about 4 billion years from now. Around 6 billion years from now, the two galaxies will merge to form a single galaxy. The video also shows the Triangulum galaxy, which will join in the collision and perhaps later merge with the Andromeda/Milky Way pair. According to a study published this month in The Astrophysical Journal, the collision between our Milky Way and fellow spiral galaxy Andromeda will occur about 4.5 billion years from now. The new research is based on observations made by the European Space Agency’s (ESA) Gaia spacecraft. 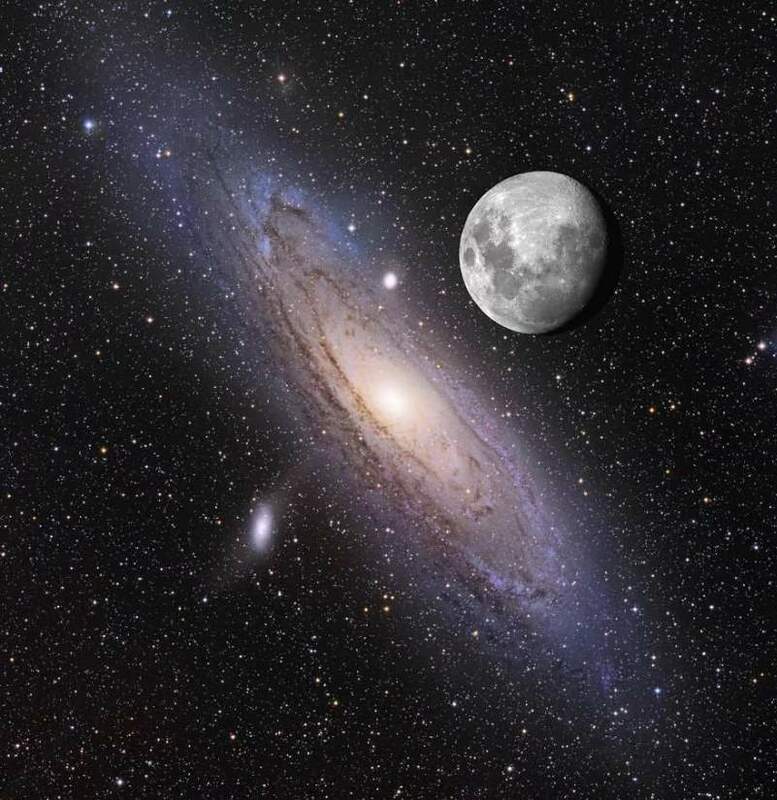 How to find Andromeda Galaxy in the sky? 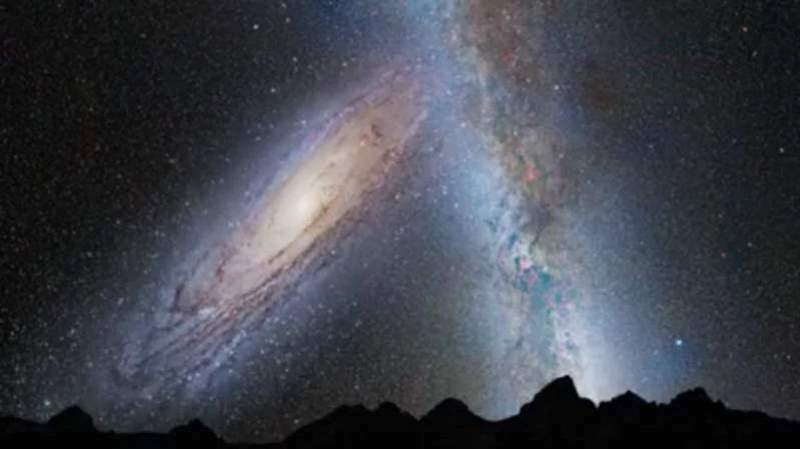 How to find Andromeda Galaxy in the sky? It is best seen during autumn nights in the Northern Hemisphere. First, you have to find a really dark place, far from the city lights in a dark, moonless night. Evening is an ideal time. Then, look to the east. You’ll need to find the “Great Square of Pegasus”, a large square pattern of stars. The four stars of the square are a conspicuous sight in the autumn night sky. Then, follow the stars from the top left corner of the square towards the star Mirach (Beta Andromedae). Then, jump to the star above Mirach – it is Mu Andromedae (μ Andromedae). Andromeda galaxy is very close to it in the sky, approximately at one o’clock direction.